Sit beside a waterfall on a snowy day as you warm your toes with a vigorous hydromassage – it’s nice to come home to an Altamar™ hot tub. 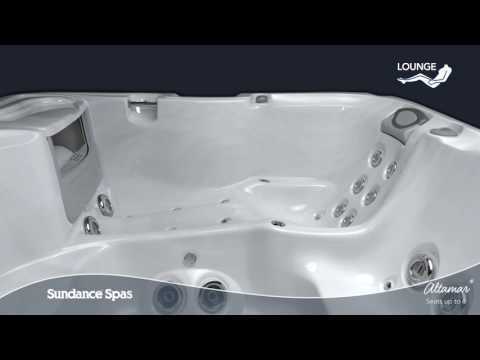 Invite loved ones to join you, too.The Sundance® Altamar is one of our friends and family spas, large enough to seat 5-6 adults, and offering more seat varieties than most other family spas. The Altamar spa features the popular lounge seat with wrist and calf jets, a total-body relaxation feature you won’t find in other family spas. For an effective back massage, sit back in the Accu-Stage™ therapy seat and let the jets work out the tension, from your neck to your lower spinal area. If you’re looking for a luxury family spa with high-performance features and versatility, the Altamar rises above the ordinary.